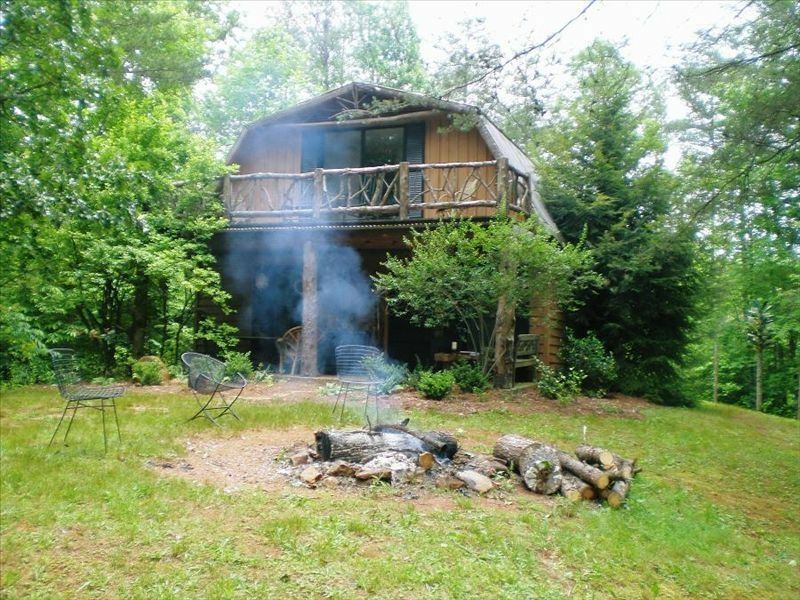 Sit back and relax in this beautiful 3 bedroom 1 ½ bath cabin nestled in the heart of the Georgia Mountains. This authentic mountain property is the perfect getaway for a romantic weekend, a Georgia wine country tour, an easy escape from the city, fun with the family or for an adventure packed vacation. This very private, designer decorated gem offers a mountain feel with all the luxuries of home. Beautifully decorated with custom artwork and high-end finishes, this home comfortably sleeps up to 8 people with a king bed in the spacious master down stairs and a queen bed in one and 3 queen beds in the other of the 2 upstairs bedrooms. The master bathroom is spacious with a large shower and the upstairs ½ bath provides easy shared access for the two upstairs bedrooms. Hand crafted, unique designer wall coverings make both baths unique and enjoyable. There’s even a custom built outdoor shower that can be enjoyed by one or more! The upstairs bedrooms also have access to the second story deck that provides comfortable seating to take in the native foliage. If cooking is your thing, you can use the fully equipped (down to the homemade ice cream freezer) gourmet kitchen or enjoy the outdoor charcoal grill. Take advantage of all the area has to offer and spend a day or more touring the nearby local Georgia wineries (Free Wine Tasting Passes for Award Winning Crane Creek Vineyard included with Rental), hiking the nearby Appalachian trail, biking on the many nearby mountain paths, dangling your feet or fishing pole in the nearby river, discovering beautiful Desota Falls, floating down the nearby Chestatee River in your own private tube, or simply enjoying a picnic at nearby Vogel State Park. You are conveniently located just 75 miles north of Atlanta in the heart of Georgia Mountain Country with all the bounty the area has to offer to provide the perfect vacation experience. 2 night minimum stay required, 25 years or older to rent cabin, no pets, no smoking. I absolutely loved our time here. My family came up for a weekend to celebrate my son’s (who is a student at UNG) birthday. The location and decor of the cabin lended perfectly to a relaxing, quiet get away to the mountains. I love that it wasn’t too far off the beaten path so acess was easy to the cabin as well as local attractions. The cabin was well stocked with everything we needed. I would mention that it appeared there was a problem with the fire place as smoke did back up into the house so we had to stop using it. We loved the fire pit and spent time out there roasting marshmallows. I highly recommend this place if you’re looking for a low key, quiet getaway, nothing fancy but absolutely worth the price. I hope we’ll be able to stay there again in the future. Had a great long weekend at this awesome cabin!! This was our second stay and we enjoyed it just as much as last time! Randall, thank you again for allowing us to stay again and for being so attentive! The cabin has some charming features and could be a delightful place of a quiet mountain get-a-way. Low slung cars would have a problem navigating the hill to this cabin. Fortunately my Rav 4 did not have problems. The cabin is perfect for 3-4 people - over that and the outdoor shower becomes a necessity. It's great to have several queen sized beds plus a king size to choose from. Comfortable,with plenty of towels and bedding available. The kitchen is amazingly well stocked with utensils, dishes, and glasses. Bottled water is a must in this region - seems like a high iron/mineral content. We did not take advantage of the porch and deck areas due to an overabundance of spiders (that time of year). The property is very well situated between Cleveland and Blairsville with fabulous eating spots in both locations. Easy to get to many wineries and other places of interest (Helton Creek Falls and the Byron Herbert Reece Heritage Center & Farm were two super interesting visits). The cabin was perfect! Very cozy and comfortable. The decor is mountain rustic and very tastefully decorated. The beds were comfy with plenty of blankets and pillows. Our stay was wonderful and the cabin was perfect and just as described!